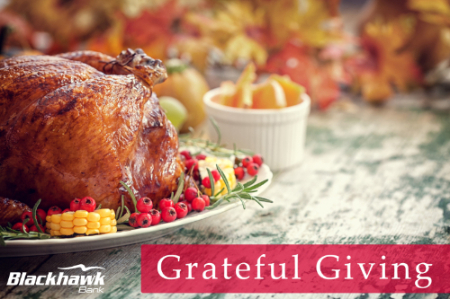 October 24, 2018 (Beloit, WI) – Blackhawk Bank’s annual Thanksgiving food drive, called Grateful Giving, has begun. The goal of this community food drive is to provide Thanksgiving Day meals to 500+ families in need through The Salvation Army of Beloit, St. Vincent DePaul, Old Stone Church, Victory Outreach, Rock River Valley Food Pantry, Belvidere/Boone County Pantry, and Janesville’s YWCA Domestic Violence Shelter. Non-perishable items needed include stuffing mix, instant potatoes, canned cranberries, yams, sweet potatoes, corn, green beans, fruit, macaroni and cheese, cake mix, and icing. Funds collected will be used to purchase turkeys and hams. Supporters can track the progress of Grateful Giving through the Blackhawk Bank Facebook, Twitter, and Instagram pages. In advance, thank you for your support. Working together, we can make a positive difference in our community.